Recoil is a full featured WindowBlinds skin with substyles for Windows 7, Vista and XP. The wallpaper shown is included and comes in 3 sizes (1280x1024, 1600x1200, 1920x1200). 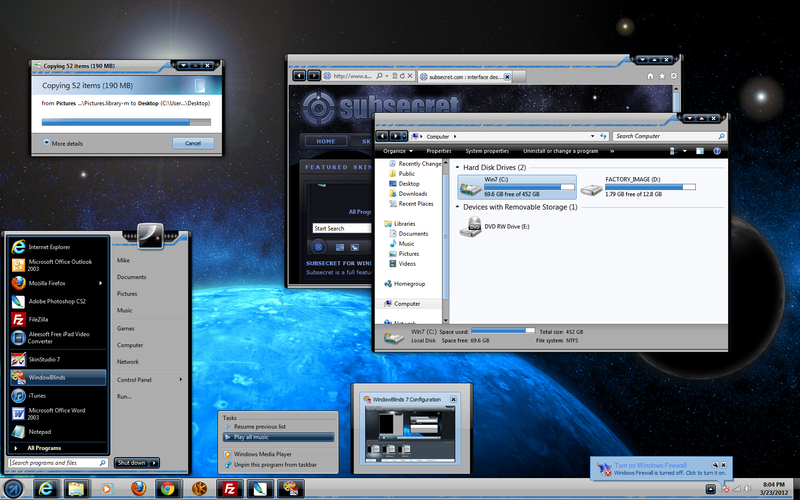 The WindowBlinds skin and wallpapers are included in the zip file. You're a genuis! You already know that. Finally!! Where ya been ya slacker?? Don't leave it so long next time, ok? WOW! i thought you had been washed out to sea. welcome back, mike! Mike, if I diable the user pic in the start menu, will I end up with a "hole" or is the black coil continuous behind it? A great WB! I have a lot of yours and all are terrific. Thanks a lot. Excellent work as usual Mike, welcome back, thanks! Absolutely superior work. I hope to see more from this "newcomer." Oh yes another great Mike skin to add to the collection like a lot awesome man don't ever stop! Congrats on the feature Mike. Is there any way we can download just the wallpaper? I like the wa it looks but I am always leary about paying for a skin because one of my critera for a skin has to the ability to change the all over font and some of the best looking skins would notr change fonts even after tweaking and restarting. It is a good looking skin though good job!